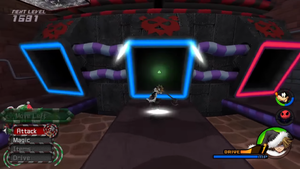 The fountain shoots acid at Sora, among other hazards. You begin the world in the Graveyard. Open a chest to the right for a Mythril Shard, then one to the left by the large gate for a Serenity Gem. 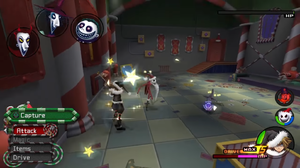 Follow Zero into the Halloween Town Square for another scene that will place you in Dr. Finkelstein's Lab with new party member Jack Skellington. Open the chest for the Halloween Town Map, then exit to the Square for a short battle against some Heartless, Wight Knights in particular. Take note of the environment as well, as landing a stray hit on some landmarks will cause them to retaliate; the gate swings out at Sora, the guillotine drops, the grates launch acid upward (and Sora with them), and the fountain shoots acid. After the battle, open the chest by the guillotine for an Energy Shard and another by the attacking gate for a Mythril Stone. Examine the tree to enter an entirely new area. From now on, this will act as the gateway between Halloween Town and Christmas Town. Return to the Graveyard and head straight to the Hinterlands. A chest behind a tree to the left contains an AP Boost. A chest to the right contains a Lightning Shard and another one up ahead contains a Mythril Stone. 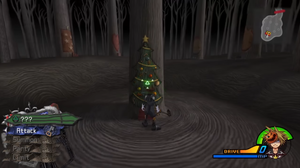 Examine the tree with the Christmas tree decoration to find yourself on Yuletide Hill in Christmas Town. 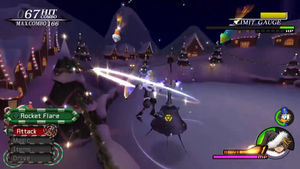 Use the save point and moogle if you wish, then continue to Candy Cane Lane, where another Heartless battle awaits you. This one will be a bit more difficult, as it introduces a new, tougher enemy in the form of the Toy Soldiers. These look like harmless boxes until a toy soldier pops out to shoot Sora repeatedly, dealing significant damage with each shot. To counter this, either use Jack's limit or catch them in aerial combos. Toy Soldiers are capable of shooting Sora high into the air. Perform aerial combos to void their chance of retaliation. After the battle, open the chest by the large double doors for a Lightning Stone. To the left of the entrance is a Mythril Gem. To the right of Santa's House is a chest by another house, and, lastly, the chest right next to Santa's House contains a Mythril Stone. Enter for a scene in which Sora receives some bad news, then open the chest to the right of the save point for an AP Boost. Open the large chest for a Christmas Town Map. Go deeper into the house to enter the Toy Factory, then follow the footsteps of Shot, Lock, and Barrel after the scene. 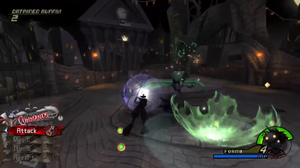 Return to the Graveyard in Halloween Town, then take a left up the path and exit through the gate to enter Curly Hill for a boss fight. 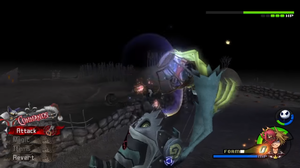 The Heartless becomes invulnerable to normal attacks when it is in the midst of eating one of its prisoners. Begin by performing aerial combos, and going into Valor Form if your health gets low or simply to speed up the process. 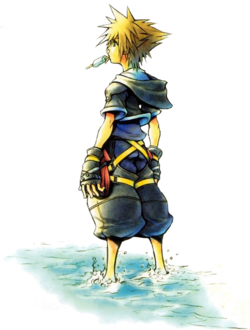 The Prison Keeper has two powerful moves to look out for; the first has it twirl with its claws, creating a sharp whirlwind that can combo Sora into the air if caught. The second has it spin in mid-air while it disperses orbs of harmful energy in all directions. The former can be avoided by stepping back, though nailing the timing is difficult in this case, and the latter can be much more easily avoided by sneaking under it. It can also be caught in an air combo while it's shooting, effectively canceling the move. Occasionally, the Heartless will look to the prisoners for aid and pour one at random into its mouth. This subtly changes its attack style, but the process of absorbing the prisoner itself leaves it impervious to attack. This is with the exception of the Inside Combo reaction command. However, though the reaction command does do some damage, it doesn't completely interrupt the process, and the Prison Keeper may still attempt to show off its new moves (such as throwing massive fireballs, which can be avoided by hiding behind the hill). Eventually, the Prison Keeper will swallow another prisoner in order to add even more attacks to its arsenal. Pay it no mind and stay on the offensive until its HP is drained to earn Sora Flash Step, Donald Hyper Healing, and an increase in maximum HP for Goofy and Jack. After the battle, chase after the captive Santa and the newly-resurrected Oogie Boogie through the Hinterlands and back into Christmas Town. Go to Santa's House and into the Toy Factory to trigger a boss fight against a familiar foe. Launch boxes into Oogie's lift to make him vulnerable to attacks. This battle has two steps to it. Oogie Boogie is on a high lift, blocked off from attack, while the party is trapped on a narrow conveyor belt. Fortunately, boxes will come trickling out onto the conveyor belt at a steady pace. Use the reaction command Fore to launch boxes into Oogie's lift, increasing the weight of it until it cracks under the pressure, sending Oogie falling onto the belt below. While he will occasionally toss bombs, maneuver lasers, or unleash a massive boxing glove on Sora, these can easily be avoided, and don't do a good amount of damage. Combo him while he's down and eventually, Oogie will once again become invincible as he runs back to his lift. After this sequence, the conveyor belt will suddenly be sped up considerably. Jump to avoid the spikes at the back of the belt, then continue launching boxes. Watch for the colors of the panels to follow Oogie onto the correct conveyor belt. After Oogie takes enough damage, he will begin to change up his strategy, moving his lift to different conveyor belts in order to avoid Sora. Pay attention to the colors of the panels at the end of the belts, as the corresponding colors will indicate which belt Sora will be taken to. 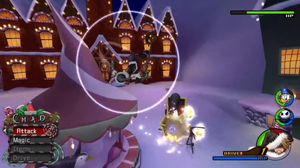 Once Sora ends up in the same place as Oogie, the assault will continue, with Heartless pouring out onto the belt as well as boxes that can be launched. Get the Heartless out of the way quickly before continuing the effort to break Oogie's lift. 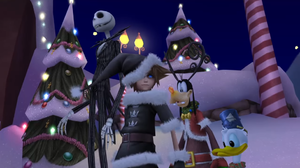 Continue the tedious pattern until Oogie Boogie is finally defeated for good, earning Sora an extra item slot, Donald and Jack an increase in maximum HP, and Goofy the incredibly useful Once More. After the scene, reap your reward for clearing the world in the form of Magnet magic, then continue to Pride Lands. Aim the boxes at Lock, Shock, and Barrel when knocked out and use the reaction command to capture them. Jack will join the party in a new outfit, and you'll find yourself in Santa's House. Head into the Toy Factory and then to the second floor for a fight against Lock, Shock, and Barrel. The party is up against all three of the troublemakers, but they're fairly weak and their health can quickly be taken out. However, after being knocked out, they wake back up after some time with recovered health, ready to wreak havoc once again. To lessen the chance of having to knock out one of the kids twice, lock on to one and leave their HP a tiny fraction of its maximum, rather than draining it completely. Lock on to another and repeat, until all three are nearing a knockout, in which case you can take them all out quickly. This gives you more than enough time to capture them. Use the Capture reaction command behind a box to trap them, taking them out of the fight for good. Defeat all three of them this way for an item slot for Sora, increase in maximum HP for Donald and Jack, and Auto Change for Goofy. Shoot 100 points' worth of toys into boxes to clear the mini-game. After the scene, head to the Halloween Town Square. Look for the Heartless with the present bubbles over their head and defeat them to take them back. Back at Santa's House, return to the second floor of the Toy Factory for a mini-game. Speak to the elf to get started. You'll be placed behind a cannon, where Sora will shoot toys into boxes as gifts. Use to shoot and, when you run out of toys to shoot, to reload. Shooting at the bigger boxes will require more toys, but will also net you more points. 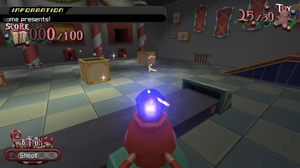 Eventually, Lock, Shock, and Barrel will show up to get in your way once again by stealing presents; like before, you can knock them out, this time by shooting toys at them. After 100 points, the mini-game will be cleared, though you can always speak to the elf again to retry for a higher score. Speak to Santa after the scene to place the presents in the plaza, where the party will catch the real culprit red-handed. Use limits to distract the Experiment while performing combos. Start by performing aerial combos or a limit, or even going into a Drive Form, because this boss will become invincible shortly into the battle. It will start by separating its body parts, which can become a critical situation as they spin across the field and shoot lasers. The best thing to do in this situation is the Kickspring reaction command, making sure to aim the part at the Experiment's body. Eventually, if you performed the reaction command correctly or simply if enough time, the body will come back together and resume its usual attacks. 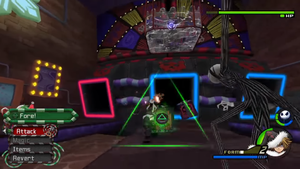 There are some attacks to look out for while the enemy is in this stage, such as an attack involving it shooting multi-directional lasers out of its secondary head, but none of these attacks are as threatening as those it performs when it's apart, and it is very easily caught in combos. Rush to use Kickspring when it splits apart and use limits or a Drive Form when it's together to defeat it as quickly and painlessly as possible. For clearing the battle, Sora, Goofy, and Jack will obtain upgrades in maximum health, while Donald earns Jackpot. 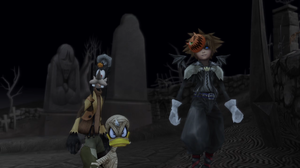 After the scene, Sora will also receive the Decisive Pumpkin Keyblade. It is at this point that Chip and Dale will direct you back to Twilight Town. If you wish to further the main story, go there. If you wish to complete the rest of the worlds first, return to the Pride Lands. This page was last edited on 29 September 2017, at 01:23.